Foie gras ON my Kobe burger, because I said so. Fun valentines dinner with friends! A favorite with both locals and visitors, Andre's Bouchee has specialized in great Bistro Cuisine, established with their French and Mediterranean roots with a twist of local, seasonal and classic dishes created by Chef Jacques Zagouri. 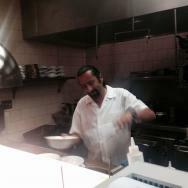 An extremely handsome and smiling, Chef Jacques can be seen Wed thru Sundays 11am-2pm lunchtime and 5:30pm to 9:30pm as he prepares authentic French Bistro Cuisine with a Californian Coastal flair. Proprietor Elizabeth Lemaire has created a warm, neighborhood chic and friendly atmosphere with the ambiance of a 'Parisian Bistro' complete with the food and wine to match. A step inside Andre's Bouchee is to be in a small neighborhood Cafe in Paris. Plus, diners at the Bistro have a special advantage as the restaurant offers a complete wine bar next door with a world-wide selection of wines to choose for your menu. There is a tremendous flexibility in creating wine flights for the chef?? ?s special dining choices as well. 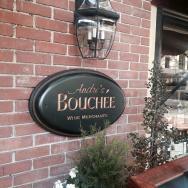 Andre's Bouch? 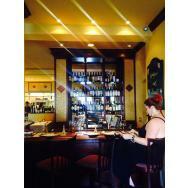 ?e Bistro and Wine Bar features wines by the glass and a full wine list. The wine bar opens at 4:30 pm daily. Dinner will be served from 5:30 p.m. - 9:30 p.m. nightly. Reservations are recommended at the restaurant, telephone 831-626-7880. We are open for lunch from 11:30 until 2:00 Wednesday through Sunday.